Have you noticed Cloud 9 yet? I always think of a ball of wool when I get to know a brand – once you pull on the string, the ball starts rolling and the story unfolds. Cloud 9 Skin Solutions was launched in August 2014 by Armen Mirzoian and his business partner. What began as a side-project turned into a quest to find solutions for problematic skin. Armen has a background in finance but a few years ago, he, together with his business partner, started looking into finding a solution to varicose vein swelling and pain ( Armen’s business partner’s father-in-law couldn’t walk properly due to soreness and there seemed to be nothing on the market that offered a lasting solution ). The more Armen got involved and the more feedback trickled in, with requests for a cellulite product ( Body Makeover Skin Firming Body gel & Cellulite Treatment is an ‘original blend of active natural ingredients & a product that really helps to firm the skin ) and treatments for other skin conditions, the more engrossing the challenge became. A factory in Macedonia (fully EU accredited), which combined old-age experience with modernity was found. More products were tested and developed and then launched. Why the name Cloud 9 ? Well, it relates to the feeling of ecstasy and joy. Armen himself had skin troubles in the past and knows from first hand experience how horrendous it can make the person feel. So the aim is to help those that suffer from skin conditions like scars, eczema, cellulite, psoriasis: ‘ when you manage to beat the condition, it is a very liberating and pleasant feeling & this is what Cloud 9 means to me’, adds Armen. With at least 40% of women expected to suffer from problems with their veins at some point in their life ( in part due to pregnancy and childbirth ), along with 25% of men, Cloud 9 Skin Solutions Nature’s Miracle Varicose Vein Treatment is a dual formula that promises to ease symptoms, improve skin’s firmness and elasticity, reduce swelling & inflammation, as well as the appearance of the actual varicose and spider veins ( certain types of them ). Extracts of Horse Chestnut and Grape Leaf help to reduce the swelling of unsightly varicose and spider veins, while Arnica helps relieve the dull ache of tired heavy legs ( sadly there are also some PEGs in the formula but that is something that I flag as I prefer skin and body care without them ). An interesting product to test, but my volunteer went a step further: she used it on one leg and Kate Shapland’s Legology on the other. Another point worth mentioning here is that Armen made it clear that this product does not remove varicose veins altogether, as that is scientifically impossible for a topical cream. However according to him, many customers reported an improvement in soreness and stiffness, as well as having their veins become less visible. But now to the tester’s feedback ( she is in her late 40s and has had fairly prominent varicose veins with each birth – she has three children ): After using the product on one of her leg’s every night, with an occasional application in the morning, Amanda started noticing a slight improvement after week four – her legs felt less tired and the veins did start looking somewhat less noticeable and less prominent. Amanda preferred the smell of Legology Air -Light ( it wasn’t developed to treat varicose veins but to tone and lighten the legs, as well as discourage oedema and cellulite ) but did like the Cloud 9 product overall smell. She also thought that the packaging was modern and eye-catching (meaning different from other products that she generally rests her eyes on ). Amanda said that she liked the feel of this product on her skin and that she will consider purchasing it for the hot summer months ( as I write this we are still waiting for them in the UK ). 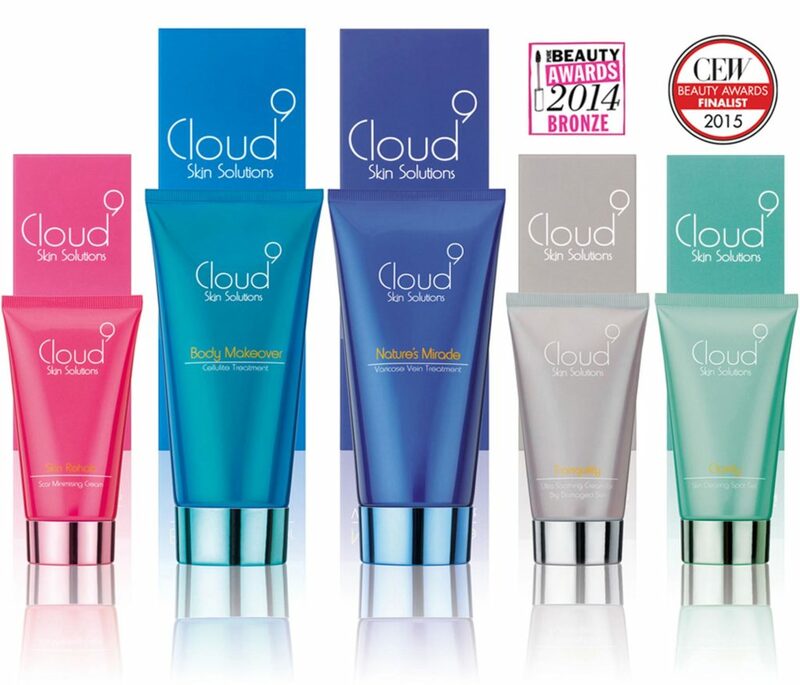 You can purchase Cloud 9 Skin Solutions products via their website here or at Space NK stores.